If you’re cheerful, mentally stable, and able to work for days on end at temperatures hugging -50 C, break coal, carry heaps of linen, teach foreigners how to use the toilet, and swerve the fists of drunken passengers, then congratulations are in order. You could be a Trans-Siberian conductor! 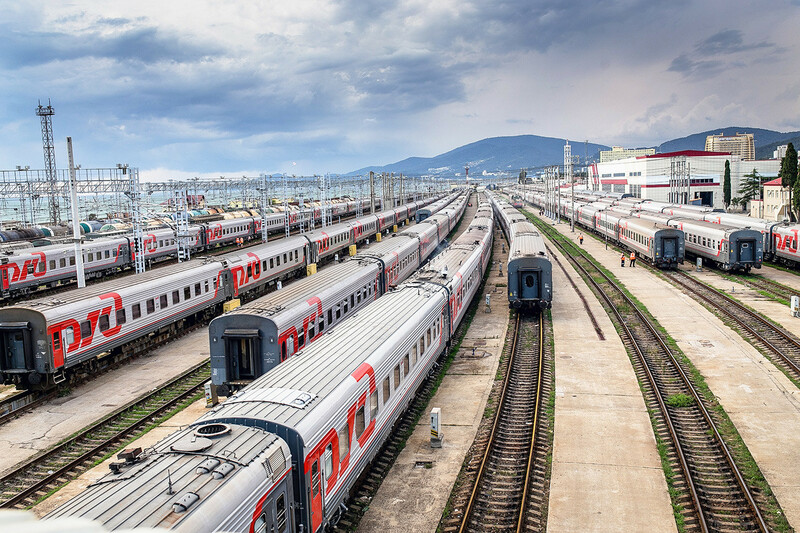 The Trans-Siberian Railway from Moscow to Vladivostok, the longest train ride in the world, takes six days and covers 9,000 km. Not everyone could endure it, but there are some who regularly ply the route, spending almost two weeks on board there and back. Who are these superhuman individuals? Conductors, of course. We investigate what it takes to be one. The journey in either direction starts off ugly: rails, mud, water, smoke, crowds, bulging sacks of linen clogging up the doorways. 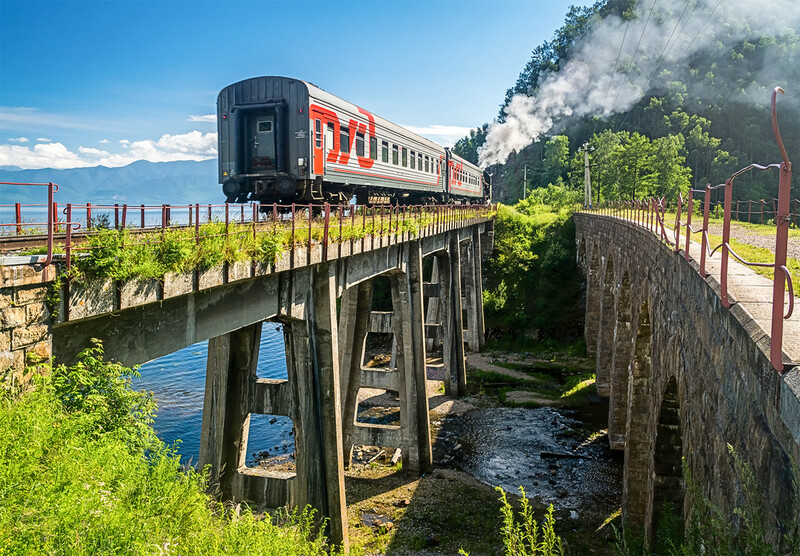 Only later do age-old pine trees, majestic rivers, and vast open spaces heave into view, culminating in Lake Baikal—the ultimate symbol of railway romance. The train compartment has been recently cleaned. The blue upholstery of the seats adds homely comfort, the individual lamps above the bunks glow warmly, and the large-mirrored door reflects a well-groomed woman of about 50. 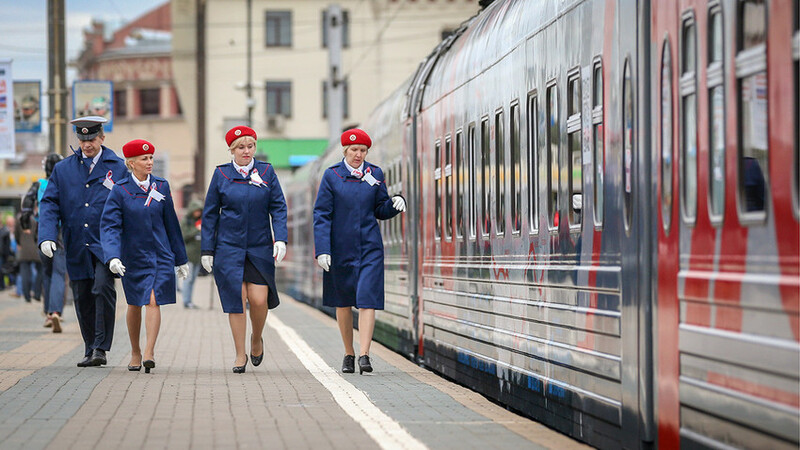 Former conductor and now train manager Irina Zolotenkova says that her whole life has been connected with the railway. Her parents were railway workers, and she studied at a “special railway school,” followed by a specialized institute. “The profession always appealed to me, so I decided to enter it. 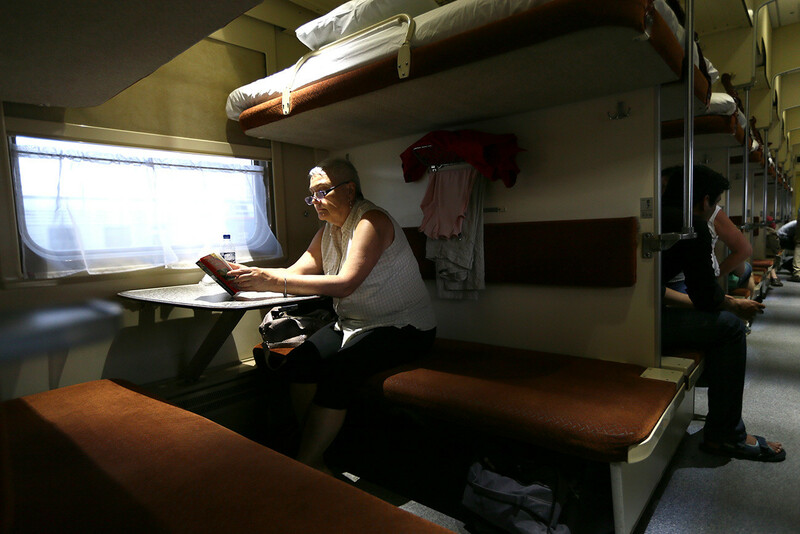 It was the 1990s, when no one got paid, but you could live on the railway,” recalls Irina. Before the war in Ukraine, she worked on the Kiev line, but then switched to the Trans-Siberian. The work is harder and the journeys longer, but Irina likes it. I ask how she copes with the flow of passengers and the endless scenery through the window. “You just have to be open and patient. Sometimes in the midst of a conflict, you have to pause, sit down in the compartment, and try to settle things for all the passengers involved,” says the train manager. We are interrupted by a phone call. A conductor reports that her work partner is sick, and without her she can’t do the ride either. Irina sighs and explains that such situation is common. Usually, conductors work in pairs and are very reluctant to do the journey with someone they don’t know. “It’s like a cop duo,” laughs Irina. “You have to know the other person has your back. Partners are like family. There might be arguments along the way, but there’s no one else they’d rather do the two-week ride with.” I take the opportunity to ask what her real family back home thinks about her long absences. “My husband, children, and even daughter-in-law are railway workers, too. My husband can take time off and arrange his schedule to fit in with mine. We’re together four days a month,” says Zolotenkova. I ask if ten days off is enough time to recover from a trip. “The first few days are really relaxing, but then you start to miss work,” she reveals, before being interrupted by another work-related call. Before departure, mechanics scurry round the depot, swarming workers splash soapy water over the train, while the conductors clean the compartments and sort out the bed linen. When it’s done, I manage to catch hold of Irina Bulatitskaya, who works as a conductor in a pair with her husband. “Sometimes they hook up the rail cars just half an hour before leaving the station. They’re in a terrible state and the conductor has to put everything right. If the car is dirty and cold, and the boiler isn’t lit, the passengers are grumpy from the very start. And it’s the conductor who takes it on the chin,” says Irina. But she likes the job. Five years ago, she had to leave everything behind in war-torn Donetsk and come to Russia. Now 38, she has been working on the railway for the past three years. “You have to be a psychologist to be able to tame the most aggressive passengers. For some, alcohol is the best way to kill the time. Some people get horrendously drunk. They come at me with fists flying. Recently, a pie-eyed passenger was being rowdy during the night, and the neighboring passengers complained. I asked him to calm down. No reaction the first two times, then the third time he rushed at me. Fortunately, the other passengers got hold of him. Then the police took him off the train,” smiles Irina, as if telling a joke. “First of all, you need to have nerves of steel not to be rude and to apologize even if you know you’re right. After all, a passenger complaint can get you fired. But things have improved after a lie detector test was introduced. Now if there’s a complaint and the conductor says they performed their duties politely and professionally, they can take a polygraph,” explains Irina. “I guess if things heat up, you have your husband to back you up,” I conjecture. “You have a tough job and barely get to see your children. You can be fired because of some troublemaker on board. How much do you get paid for it all?” I try to understand what motivates conductors to get out of bed in the morning. “The salary is based on ‘wheel time.’ If the wheels are spinning, we get paid. Time spent on preparing the carriages or making the beds is not counted. It works out at about 30,000 rubles a month, not a lot. Even if I wanted to work an extra weekend to clock up more mileage, I couldn’t. The computer keeps track of our schedule so that we don’t turn up for work exhausted,” she replies. “If you were offered a less stressful job with a good salary, would you leave the railway?” I persist. 47-year-old Vyacheslav Volodin has been working as a Trans-Siberian conductor for four years, although he never dreamed of doing so. On returning recently to his empty apartment in a snow-covered provincial town 8,500 km from Moscow, he threw on the floor an enormous bag of dirty laundry from a two-week shift last March. He will wash it himself when he’s had a rest. After retiring from the army, Volodin hoped to become a train electrician, but the regulations required that he should work first as a conductor. He declines to talk about his past life and the events that divided it into “before” and “after.” Today, he lives for the Trans-Siberian. He too has a regular colleague, but, unlike others, does not shy away from teaming up with unfamiliar partners. “At first, you take time to look out of the window and photograph Baikal... But soon you stop noticing anything except the vestibules and toilets. 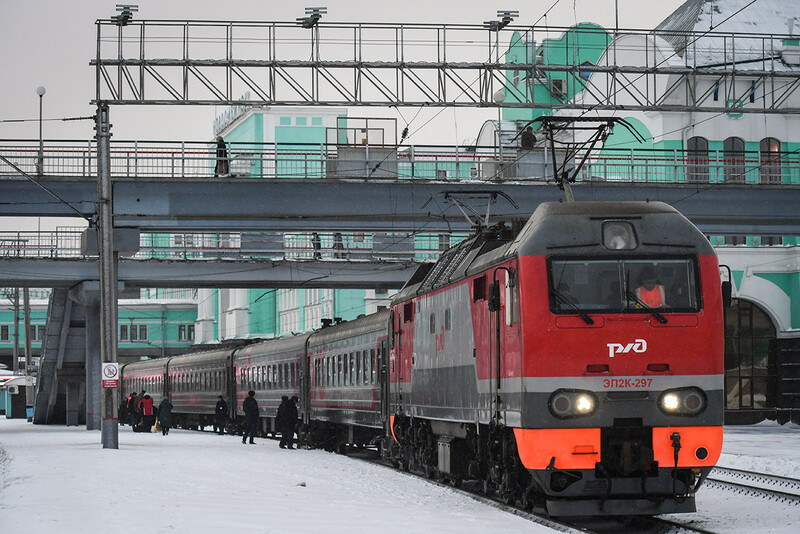 There’s always cleaning to be done or passengers to seat, or if it’s a section of track without power, you have to heat the coal stove,” says Vyacheslav. Recalling foreign travelers he encountered during the 2018 FIFA World Cup, he becomes noticeably animated. “Peruvians, for example, went around barefoot. I couldn’t explain to them they should wear slippers at least when going to the toilet. They went in their socks. As you know, if someone’s had a wash there, the place is a swamp,” says Volodin. Like many of his colleagues, Vyacheslav does not speak fluent English, but gets by with his school knowledge. When that dries up, he switches to hand-speak. If all else fails, he points to seat numbers on the ticket or personally takes passengers to their compartment. “The most difficult thing to explain is that the trains have vacuum toilets, so you can’t throw anything down them. I take a group of Chinese to the toilet and, pardon the detail, show them where to put the paper after wiping themselves,” the conductor smiles. “What about Russians?” I’ve already heard about drinking and smoking, but they can’t all be like that…” I suggest hopefully. “That happens, of course, but most of them are fine. Some who journey all the way from Moscow to Vladivostok are like family by the end,” Vyacheslav laughs. “Once a couple was traveling from Irkutsk, and we became friends. They said if I needed anything in Irkutsk, I should call and they’d fry me some pork chops,” replies Volodin. Towards the end of our conversation, it becomes clear that for Vyacheslav being a conductor is more than a job. Although he describes it as routine, it seems that the passengers are a substitute for the family he does not have. He has almost a week off before his next shift, but knows that he’ll feel the pull back to work sooner than that. “I don’t know what to do with myself in between rides. The train becomes your life,” explains Volodin.